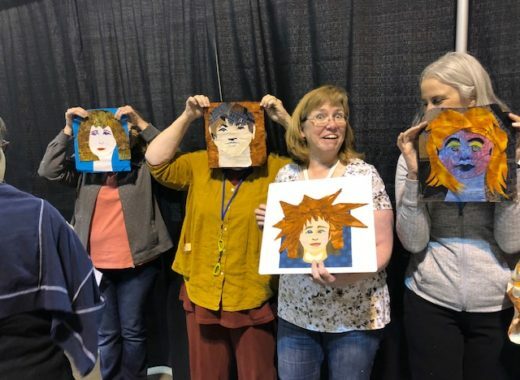 Now that you’ve chosen which kinds of shows to enter (quilt, art quilt, fine art) how do you keep track of it all? You’ve seen the list of shows that feature art quilts. You’re pretty sure you know which ones appeal to you. Now what? Well there are myriad ways to get your act together – here is how I do it. I like to see the big picture with my lists – all the dates on one page. I’m very visual. 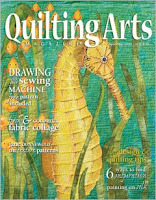 Waaaay back when I wrote an article about the topic for Quilting Arts Magazine, called Where and How to Show Your Artwork. April/May 2007. I kept a notebook back when I was in the swing of things. Front page and pack page had two lists, one with shows by entry dates as seen here. This one is printed right from the list on my website. The other described below. First – make a list of shows you are thinking of entering in order of shipping deadlines Make sure you note entry dates and which are postmarked and which are “received by.” Note any other pertinent entry info such as size requirements or expiration dates (my personal pet peeve!) I also noted prized money, commission fees, or anything out of the ordinary such as a live jury (in which you are required to send your actual quilt in for a second jury round.) Oh! Don’t forget the virgin quilt rule!!! If any images of your piece filter out anywhere, and I do mean anywhere – like blogs or your Aunt Martha’s Facebook page included, you are OUT! Second – choose which quilts might go to which shows and note them. The reason my first list if by shipping window is so I can make absolutely sure that shows don’t overlap. 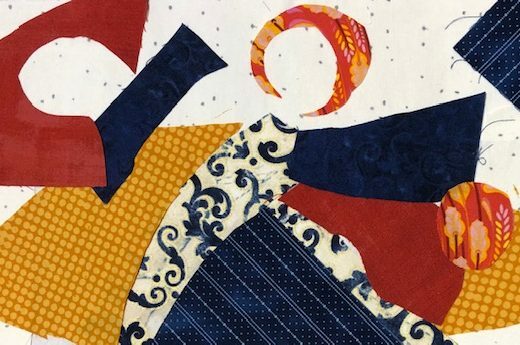 It’s a BIG no-no to enter a quilt in a show, have it accepted, then to withdraw it because it already got into an overlapping show. 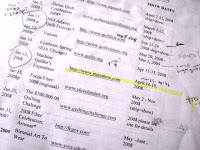 Third – when a quilt is accepted into a show I put the shipping date on my calendar in big bold letters. My worst nightmare is to forget to ship a quilt. Funny story. As I was packing down one show I had curated I noticed that there was a quilt missing. As far as I knew, it had never arrived and somehow I had missed seeing that. Immediate panic. Had the quilt been lost in the mail for months? I took a big gulp and called the artist. She had completely forgotten about the show and hadn’t sent it. I was SOOOOO relieved. At the same time, I had to laugh because that is so like something I might do. Sleeve protecter for copies of entries I had sent out. I wrote big and bold on the top corner of the form the names of the quilts. Sleeve protectors for accepted entries. I wrote (again) big and bold the shipping deadline and filed them in order. 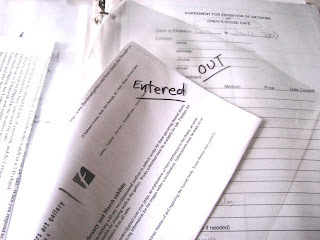 Sleeve protector for entry forms of quilts that were currently out. Sleeve protector for quilts that had come back in. Page with all the vital stats for my quilts: date, size, price, insurance info. 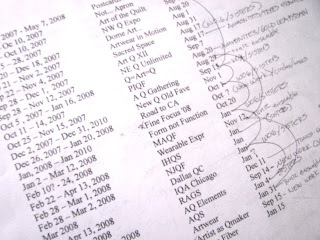 Page for each quilt with a sow history and awards, yes – I also fear I’ll enter the a quilt in the same show twice. I have a sieve for a brain. Sleeve for appraisals and their copies. Of course all of this information can be kept on your computer now. (Then again, when is the last time YOU backed everything up?) It’s getting easier with digital entries and burning a CD or mailing off a jpg is much easier than sending slides. Robbi Ecklow’s article Use Calendars to Keep Track of Your Show Submissions in Quilting Arts Magazine February/March 2010 brings things quite up to date. In it Robbi shows you how to use any calendaring program (she uses ical) to list the entry deadlines as well as shipping and show dates. Thank you for this series on entering shows. It had been most helpful. All of these blog posts about entering shows have been so informative and helpful. I like the idea of a binder, something I should do. Thank you for sharing your knowledge. QN does have a very strict “virgin” rule – but every once in a while another show will try to pop that rule in. Always read the rules carefully. It’s a personal failing I have – not paying attention to details and the one time they change it it will get you. 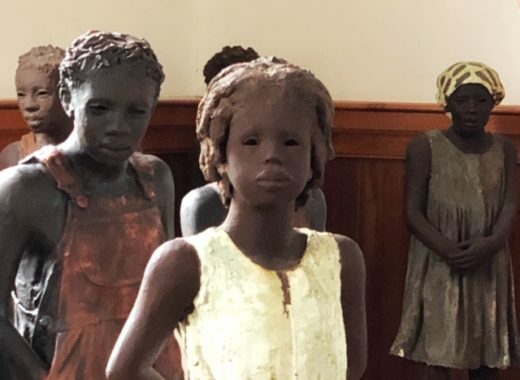 Still – how cool is it that we all get to make beautiful things and then share them with the world? I thought Quilt National was the only show that had a “virgin” rule. Wow, this is great information. I like the binder idea. And also thank you for your "where to show" website; that's something I was looking for for a long long time. 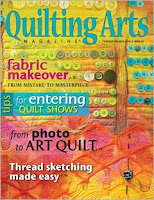 I'm just a quilting dabbler and this has been a real eye-opener! I had no idea there wer so many shows and so much to keep track of!